Accommodation in RIPON, North yorkshire. A taste of English country living at its best - relax and unwind with a wonderful rambling 16th century farmhouse B&B with AA 5 Star Rating, in beautiful countryside near Fountains Abbey. Four spacious and really comfortable en suite guests bedrooms, two on the ground floor. Big snugly beds, delicious breakfasts featuring lots of local produce and choice - bliss! On Sunday 21st April 2019 the sun will rise at 05:51 and will set at 20:19. It will be a mild day, with temperatures reaching around 21.5°C. Today is expected to be a dry day, with a very low chance of rain. It will be quite a breezy day, with a maximum expected wind speed of 18mph. On Monday 22nd April 2019 the sun will rise at 05:49 and will set at 20:21. It will be a mild day, with temperatures reaching around 20.4°C. Today is expected to be a dry day, with a very low chance of rain. It will be quite a breezy day, with a maximum expected wind speed of 21mph. On Tuesday 23rd April 2019 the sun will rise at 05:47 and will set at 20:23. It will be a mild day, with temperatures reaching around 16.9°C. Today is expected to be a dry day, with a very low chance of rain. It will be quite a breezy day, with a maximum expected wind speed of 18mph. On Wednesday 24th April 2019 the sun will rise at 05:45 and will set at 20:25. It will be a mild day, with temperatures reaching around 14.2°C. A few showers are expected, 4mm of rainfall is possible today. It will be quite a breezy day, with a maximum expected wind speed of 19mph. On Thursday 25th April 2019 the sun will rise at 05:42 and will set at 20:26. It will be a mild day, with temperatures reaching around 13.8°C. Some moderate to heavy rain is expected, 7mm of rainfall is possible today. It will be quite a breezy day, with a maximum expected wind speed of 23mph. On Friday 26th April 2019 the sun will rise at 05:40 and will set at 20:28. It will be a mild day, with temperatures reaching around 14.9°C. Today is expected to be a dry day, with a very low chance of rain. It will be quite a breezy day, with a maximum expected wind speed of 20mph. On Saturday 27th April 2019 the sun will rise at 05:38 and will set at 20:30. It will be a mild day, with temperatures reaching around 9.4°C. Today is expected to be a dry day, with a very low chance of rain. There could be quite a strong breeze in the air today, with a maximum expected wind speed of 29mph. 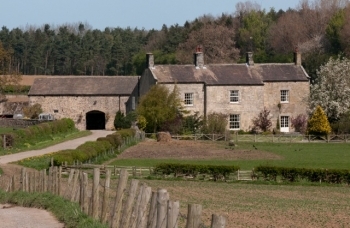 A taste of English country living at its best - relax and unwind with a wonderful rambling 16th century farmhouse B&B with AA 5 Star Rating, in beautiful countryside near Fountains Abbey. Four spacious and really comfortable en suite guests bedrooms, two on the ground floor. Big snugly beds, delicious breakfasts featuring lots of local produce and choice - bliss!